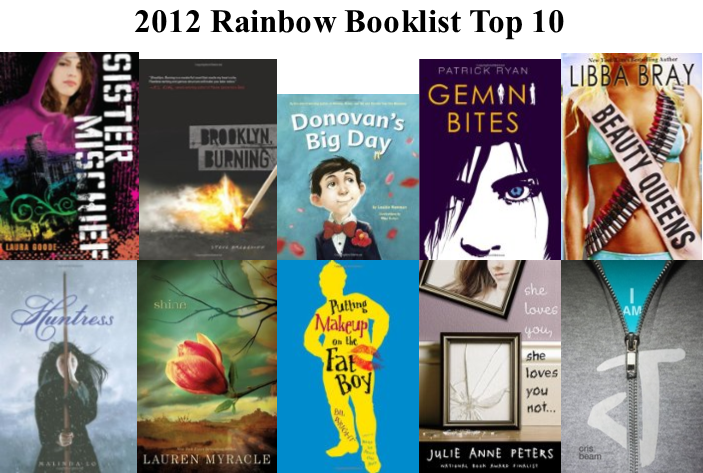 The 2011-2012 committee of the Rainbow Project, a joint task force of the Social Responsibilities Round Table and the Gay, Lesbian, Transgender and Queer Round Table of the American Library Association proudly present our 2012 Rainbow Book List. Carr, Jennifer. Be Who You Are. AuthorHouse. 2010. Unpaged. $20.99. (978-1452087252). Pre-K-2. Will is having trouble understanding why his brother changed his name to Hope, grew his hair long, and began wearing dresses. With gentle understanding and unwavering support, Hope and her parents help Will to understand and accept. *Newman, Leslea. Donovan’s Big Day. Illustrated by Mike Dutton. Tricycle Press. 2011. 32p. $15.99. ( 978-1582463322). Pre-K-2. It’s a very BIG day for young Donovan–get ready, get dressed in his best with a bow tie and be the ring bearer when Mommy and Mama get married! Belgue, Nancy. Soames on the Range. HarperTrophy. 2011. 203p. $14.99. (978-0002007689). Gr. 7-10. When his father comes out, Cisco is suspended from school for fighting and then accused of putting old man Patterson into a coma. For his own protection, his parents send the non-violent, budding gourmet chef to live with his uncle on a dude ranch in the Rocky Mountains of British Columbia. Cooper, Michelle. The FitzOsbornes in Exile. “The Montmaray Journals.” Knopf. 2011. 464p. $17.95. (978-0375858659). Gr. 6-9. After the Germans bomb their beloved castle on the tiny island nation of Montmaray, the young royal family flees to pre-war England, carrying the horrifying awareness of Hitler’s deadly potential with them. As conscience and conventions collide, each struggles to fight their individual battles for love and truth. *Lo, Malinda. Huntress. Little, Brown. 2011. 384p. $17.99. (978-0316040075). Gr. 7-up. Kaede and Taisin journey to the Fairy Queen to save not only their kingdom but also the entire world. Will their mission bring them together forever, or tear them apart? Takako, Shimura. Wandering Son, Volume 1. Translated by Matt Thorn. Fantagraphic Books. 2011. 192p. $19.99. (978-1606994160). Gr. 5-7. Fifth graders Shuichi and Yoshino find each other during the first days of school, discovering that they share a love of many different things including the secret that each wants to be the gender that the other was born. Wilkinson, Lili. Pink. HarperTeen. 2011. 310p. $16.99. (978-0061926532). Gr. 7-10. Supportive parents and a girlfriend – what more could any out-lesbian, goth-girl, want? Yet Ava decides to explore the idea of “normal”to attend prep school, kiss a boy, and even (gasp!) wear matching pink sweaters. *Wright, Bil. Putting Makeup on the Fat Boy. Simon & Schuster. 2011. 240p. $16.99. (978-1416939962). Gr. 7-10. Most teenage boys dream of being makeout artists. Carlos Duarte, on the other hand, dreams about being a makeup artist! And when he gets a part-time job at Macy’s cosmetics department, he figures fame and fortune are just around the corner. *Beam, Cris. I Am J. Little, Brown. 2011. 352p. $16.99. (978-0316053617). Gr. 9-up. Though he was born Jennifer, he knows in his being that he is completely male, just born into the wrong body. Can he make his family and friends understand what he knows, that he is J? *Bray, Libba. Beauty Queens. Scholastic. 2011. 400p. $18.99 ( 978-0439895972). Gr. 7-up. In this wildly hilarious novel, contestants from the Miss Teen Dream Beauty Pageant crash on a remote tropical island where danger and wild adventures lurk around every corner! *Brezenoff, Steve. Brooklyn Burning. Carolrhoda Lab. 2011. 202p. $17.95. ( 978-0761375265). Gr. 8-up. Running away from home during a Brooklyn summer to lose the pain through music, sixteen-year old Kid finds acceptance and more in Scout, another soul lost in the music. Cook, Trish, and Brendan Halpin. Notes from the Blender. EgmontUSA. 2011. 240p. $16.99. (978-1606841402). Gr. 9-12. Two teens, two voices: Declan, an emo goth into Finnish death metal and violent video games, is a loner with a crush on classmate Neilly Foster; Neilly, popular, smart, and a gymnast, happens on Declan’s father and her mother. Together. Then their parents announce an unplanned pregnancy. Donley, Jan. The Side Door. Spinsters Ink. 2010. 234p. $14.95. (978-1935226123). Gr. 9-12. Entering suburban Drift Falls High School in 1988, Mel and her best friend Frank discover that a student suicide five years earlier was a closeted gay teen.Â At the same time, they are themselves dealing with issues of conformity, family relationships, and coming out. Farrey, Brian. With or Without You. Simon Pulse. 2011. 368p. $8.99. (978-1442406995). Gr. 10-up. Hiding secrets from his family and friends, Evan is desperate to find a way to make all the pieces of his life fit. But, when his best friend Davis falls under the spell of the charismatic Chasers leader, he has to choose which part of his life to save. Hopkins, Ellen. Perfect. Simon & Schuster. 2011. 640p. $18.99. (978-1416983248). Gr. 7-up. Cara is struggling with her parents’ ideals of perfect, but will that cause her to lose out on a new kind of love and being true to herself? Mourian, Tomas. Hidden. Kensington. 2011. 304p. $15.00 (978-0758251312). Gr. 9-up. Escaped from his parents and fleeing incarceration and torture in an anti-gay rehab center, Ahmed (now Ben) finds temporary refuge in a so-called safe house where, even if he and his new roommates can hide from the bounty hunters, fanatics, parents, and pimps looking for them, they cannot escape their own pasts and each other. *Myracle, Lauren. Shine. Abrams. 2011. 376p. $16.95. (978-0810984172). Gr. 7-up. After her once-best friend, Patrick, falls victim to a vicious hate crime and neither local nor federal law enforcement seems interested finding the culprits, Cat sets out to discover who in her town could have hated Patrick enough to have beaten him and left him for dead. *Peters, Julie Ann. She Loves You, She Loves You Not. Little, Brown. 2011. 278p. $17.99. (978-0316078740). Gr. 9-up. After her father disowns her for being gay, can Alyssa pick up the pieces of her life and believe in herself again, in a new town, living with a mother she never knew? Reardon, Robin. The Evolution of Ethan Poe. Kensington. 2011. 352p. $15.00. (978-0758246806). Gr. 9-12. The question of teaching intelligent design brings Ethan Poeâ€™s rural Maine town to crisis, with science on one side and fundamentalist Christians on the other.Â As Ethan begins a relationship with handsome classmate Max Modine, he also deals with his parents’ divorce, his brotherâ€™s increasingly self-destructive behavior, and the fundamentalist Christian beliefs of both his brother and his best friend Jorja, while violence erupts around the local school board election. Reardon, Robin. A Question of Manhood. Kensington. 2010. 352p. $15.00. (978-0758246790). Gr. 9-12. Paul Landonâ€™s fear of being thought gay brings him to the point of helping kidnap and torture a gay classmate.Â Then, when Paulâ€™s older brother dies in Vietnam after telling Paul of his love for a fellow soldier, Paul is left keeping another family secret. Only his work with a young gay man retraining abused dogs gives Paul the courage to confront his fears. Sanchez, Alex. Boyfriends with Girlfriends. Simon & Schuster. 224p. $16.99. (978-1416937739). Gr. 7-9. The tale of a quadrangle of relationships between Sergio, Lance, Allie, and Kimoko–one bisexual, one questioning, one gay, and one lesbian–and how their loves affect their interwoven friendships. Speaking Out. Berman, Steve, ed. Bold Strokes Books. 2011.288p. $13.95. (978-1602825666). Gr. 8-up. 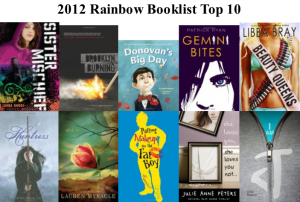 This bakerâ€™s dozen short stories, for and about gay, lesbian, bisexual, and transgender teens, encourage teens to â€œspeak out,â€ be proud of who they are, and stand up for each other. Torres, Justin. We the Animals. Houghton Mifflin Harcourt. 2011. 144p. $18.00. (978-0547576725). Gr. 9-up. Torresâ€™ acclaimed first novel is an impressionistic examination of a family of mixed race and ethnicity. Though fiercely loving, how will the family react to the youngest sonâ€™s growing awareness of his homosexuality? Welcome to Bordertown: New Stories and Poems of the Borderlands. Holly Black and Ellen Kushner, ed. Random House. 2011. 517p. $19.99. (978-0375967054). Gr. 7-up. Bordertown is where the mundane and magical worlds overlap, where elves, runaways, gay kids, and misfits come together, bringing their histories, music, machines, and talentsâ€”as well as their fears and terrors.Â Come visitâ€”but be careful. If the borders close, you may stay longer than you think. Zombies vs. Unicorns. Holly Black and Justine Larbalestier, ed. Margaret K. McElderry Books. 2010. 432p. $16.99. (978-1416989530). Gr. 9-up. Choose your side in the epic battle: Team Zombie or Team Unicorn!Â Everyday teen issues are taken to wild extremes as zombies invade and unicorns attack in these short stories. Belge, Kathy and Marke Bieschke. Queer: The Ultimate Guide for Teens. Zest. 2011. 208p. $14.99. (978-0981973340). Gr. 8-up.Â Demystifying queer issues for all teens, GLBTQ or not, this straightforward book gives answers to many topics facing youth today, from how to know if you’re queer to coming out, from dealing with queerphobia to relationships. Dear Bully: Seventy Authors Tell Their Stories. Megan Kelly Hall and Carrie Jones, ed. HarperCollins. 2011. 384p. $9.99. (978-0062060976). Gr. 7-up. Seventy authors tell their own stories of bullying–some as victims, some as perpetrators–in order to let others know it can happen to anyone, how to identify bullying behavior, and ways to get it to stop. It Gets Better. Dan Savage and Terry Miller, ed. Dutton. 2011. 338p. $21.95. (978-0525952336). Gr. 7-up. A companion to the â€œIt Gets Betterâ€ internet campaign, this collection of essays and new material brings hope to LGBTQ youth facing prejudice, bullying, and other forms of harassment. It includes a list of resources for teens and adults. Lynch, Jane. Happy Accidents. Hyperion. 2011. 256p. $25.99. (978-1401341763). Gr. 9-up. Actress Jane Lynch shares her life story, letting readers in on her path to stardom as well as her struggles with alcoholism and being true to herself. Pasfield, Scott. Gay in America: Portraits. Welcome Books. 2011. 223p. $45.00. (978-1599621043). Gr. 9-up. This tapestry of powerful and personal photo-essays maps the rich cross-section of Gay America, one distinct and memorable voice at a time.